Ancora un’altra di quelle email nelle quali ci chiedono di rispondere per beneficiare delle offerte avanzate, o con l’intento di stuzzicare la nostra curiosità riguardo certe somme che dal cielo si stanno dirigendo proprio sulle nostre teste. Sequel to our previous transaction,I am very happy to alert you that i have been able to get those funds worth the sum of $8.5M transferred under a co-operation of new business partner from Australia. Now be advised to contact my lawyer Mr. Daniel Rukah and ask him for the sum of Eight hundred and fifty thousand united states dollars ($850,000.00USD) in a certified international bank draft written and signed in your name for your compensation. Endeavor to get me informed once you receive your certified bank draft with you.Also be advised to reconfirm to him your full information such as your name,current phone number for easy communications and as well your address where the said bank draft would be delivered. 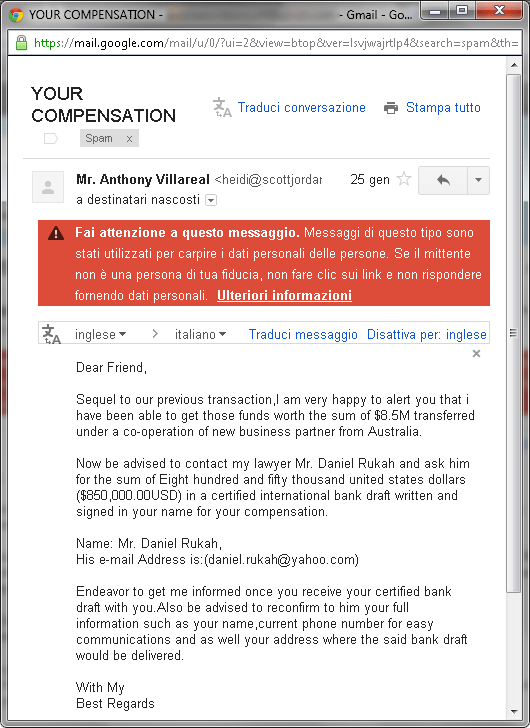 Anche in questo caso… mai rispondere a queste email… i casini in serbo sarebbero tanti!